Darlene Hilde-Rolle has gained quite a following entertaining audiences throughout the Upper Midwest, Texas' Rio Grande Valley and Arizona. 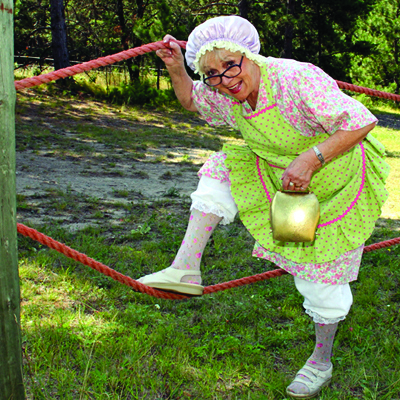 Her unique brand of comedy features Darlene as the beloved "Auntie Kreamsaugen", a streetwise self-proclaimed marriage counselor dressed in the traditional garb of the Midwestern farm wife. In addition to stand-up comedy, audiences have enjoyed her witty musical renditions of songs we all know, homespun wisdom and tall tales from the fabled "Snoose Hollow". I was born and reared in Minn-e-snow-ta in Hagen Township, a bend in the river, called Snoose Hollow. I'm Scandinavian and proud of it. I don't make fun of my heritage, I CELEBRATE IT! Halloween sure has gotten crazy again with the way the economy is going so I thought I'd save some money and whip up a batch of my famous doughnuts for the little trick or treaters. Have you ever had uncontrolled giggles at the wrong time in church? With Christmas close by it reminds me of the candle light service at Snoose Hollow church a few years ago on that snowy Christmas Eve. Ole and Lena invited us to come over for a holiday meal. Knute and I were excited to accept. We arrived at Ole and Lena's house and were immediately greeted by the aromas associated with a Scandinavian holiday meal. When Knute and I were courting, I wanted to impress him with my cooking abilities. After all, I was watching all those fancy cooking shows on the television and also often read the church recipe books. We had wonderful neighbors in Snoose Hollow. Olga was a country gal who married Sven, a 'town boy' that hardly knew how to buckle an overshoe. Several spring times ago, my niece Gina, and her 12-yearold son Lars came for an overnight visit. Gina was eight and a half months in the family way and as big as a house. She was a great prankster and Knute was always one of her favorite targets. This was good because the next day was April 1st and Knute was always an easy one to get an "April fools" joke on. Ole and Lena came to see Auntie Kreamsaugen for counseling. "Vat is it dat I can help you vith today?" says Kreamsaugen. Ole speaks up and says "She is alvays blamink me for everyting dat happens to her. Yest de odder day she comes home from de store and she is crying and says "Ole come and see vat has happened to my beautiful new car!" Many years ago, several couples from the Snoose Hollow church decided to get together on a regular basis, have a home cooked meal, socialize and play games. I wanted to outdo all of the other ladies so I planned mushroom smothered steak. When Knute heard that he said, "mushrooms are too expensive Kreamsaugen, we can't afford that!"